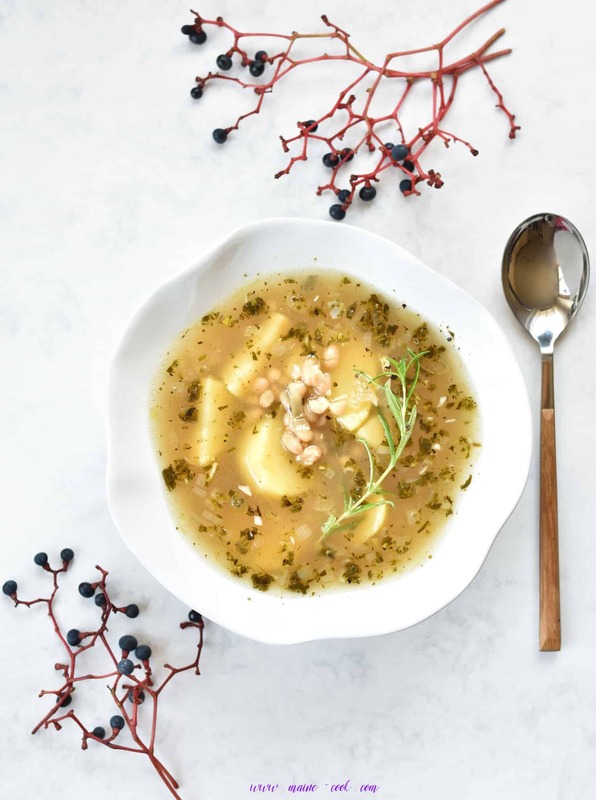 It was a huge hit in our home! Vegetarian burgers ready in about 30 minutes! This flavour combination is really brilliant. 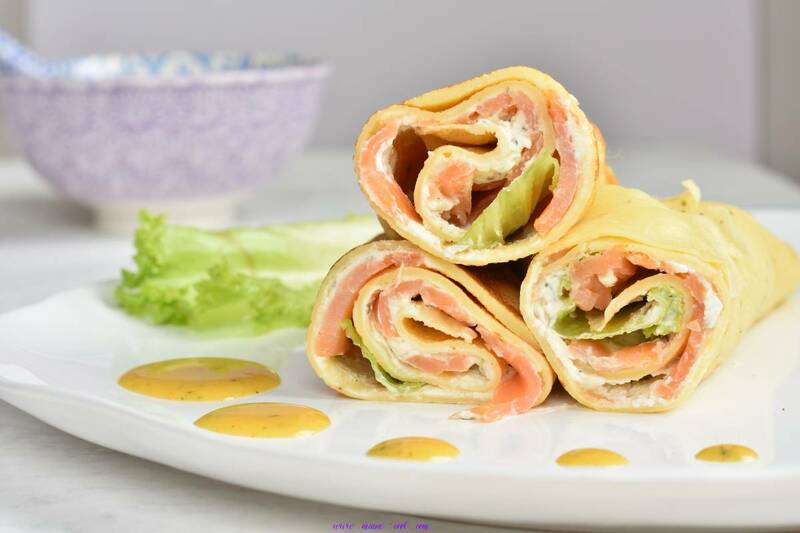 Delicious grilled cheese, sweet and sour pineapple, fatty avocado, aromatic and sour lime and coriander sauce, delicate lettuce. Scrumptious! It’s ready in no time. I used store-bought brioche hamburger buns (with good ingredients), they‘re light and buttery. 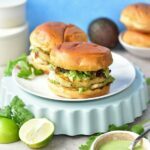 All you need to do is to mash the avocado, season with lime juice, spread on the buns. Cover with quick grilled cheese and pineapple, spoon the sauce over. Put lettuce leaves on top and cover with the other half of the bun. Ready! It couldn‘t be easier. 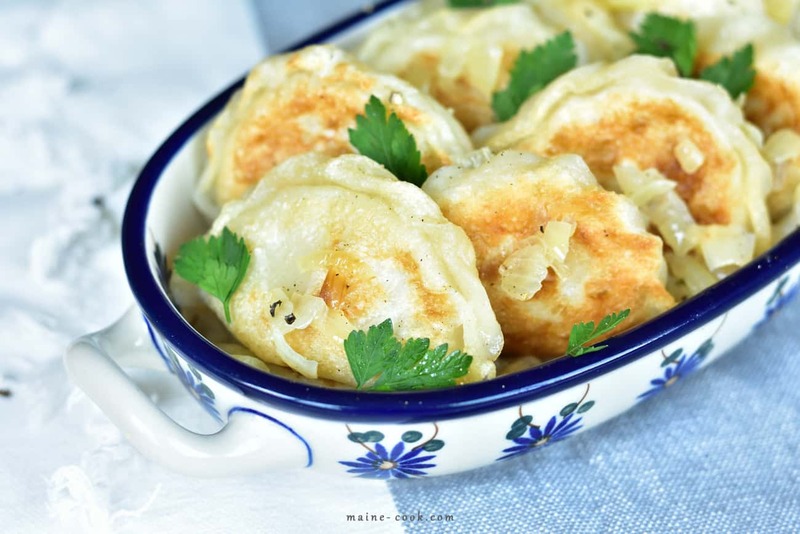 Give it a try, this dish is light, but also very fullfilling. From the other half of the pineapple you can make this pineapple, banana and lime smoothie or pineapple, mango and coconut milk smoothie. 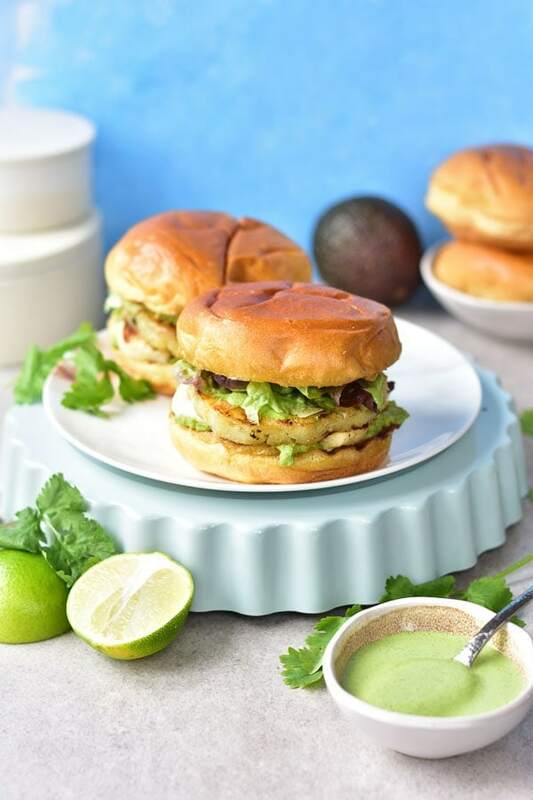 Vegetarian burgers with grilled cheese and pineapple, smashed avocado and lime and coriander sauce. Delicious veggie burgers ready in about 30 minutes! Put all the sauce ingredients into a food processor bowl, puree until smooth and thick, season with salt to taste, set aside. Heat 1 tablespoon of frying oil on a grill pan / regular frying pan over medium heat. Slice the halloumi into ¾ cm / ¼ inch slabs. Grill the slices for a few minutes on both sides until lightly browned on the outside and warm and soft through the middle. Transfer to a plate. Peel the pineapple, cut into 1 cm / ½ inch slices, cut out the tough core. Grill the slices for a few minutes on both sides until lightly browned and softened. Transfer to a plate. Grill the sliced bread rolls very briefly (about 30 seconds) until lightly browned. Transfer to a plate. Prepare the avocado: peel and remove the pits. Mash with a fork, mix with lime juice together, season with chili flakes (optional) and salt and black pepper to taste. 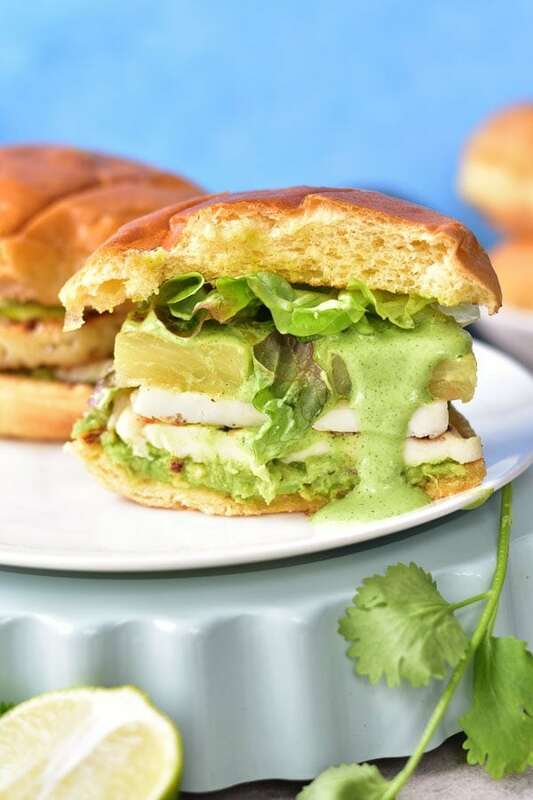 Assemble: spread avocado mixture on one half of each bun, put halloumi slices on top, then pineapple slices, spoon the sauce over, put the lettuce leaves, cover with the other half of the bun. Briami - Greek-style roasted vegetables Apple walnut and honey cake – easy and super moist! These burgers look amazing, can’t beat an avocado and halloumi mix! thank you Chloe, they were really delicious!